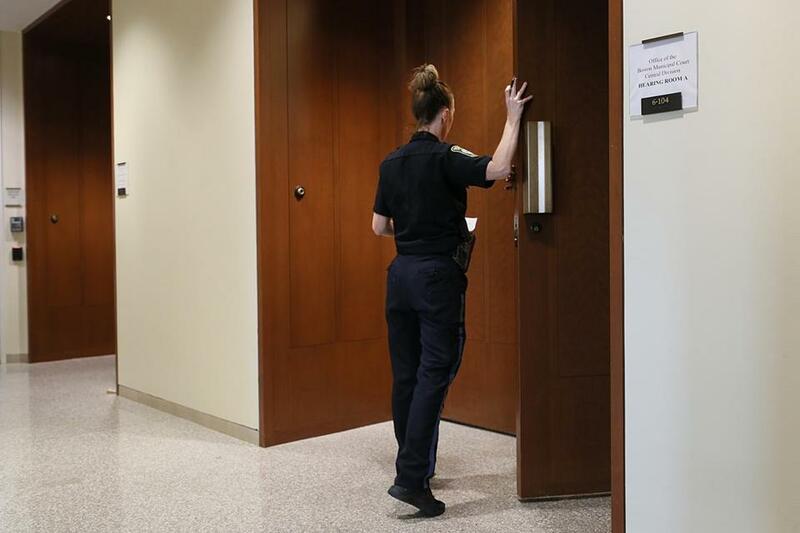 A Boston Police officer guards the door to the show cause hearings at the Edward Brooke Courthouse. It is desirable that judicial proceedings should take place under the public eye. . . . Because it is of the highest moment that those who administer justice should always act under the sense of public responsibility, and that every citizen should be able to satisfy himself with his own eyes as to the mode in which a public duty is performed. — Massachusetts Supreme Judicial Court Justice Oliver Wendell Holmes, 1894. Guess Justice Holmes didn’t anticipate the rise of that uniquely Massachusetts invention — the show-cause hearing — recently put under the microscope of the Globe Spotlight Team. Secret courts, run not by judges but by clerk magistrates, some with law degrees, some not, whatever. The irony is that our State Department and the United States Agency for International Development send teams halfway around the world to lecture other countries on the need for judicial transparency. The Holmes quote is a staple of those presentations. I’ve been part of those teams so this is, well, embarrassing — and it’s personal. Personal because for years I’ve been a member, and now cochair, of the Supreme Judicial Court’s Judiciary-Media Committee. We have spent endless hours working on making the courts more open and transparent, allowing reporters to bring in all kinds of electronic devices inside the courtroom so we can tweet and blog. We now know that for decades, the courts — including the Supreme Judicial Court — and the Legislature have been complicit in keeping these show-cause hearings under wraps. And sometimes, well, not so much. After all, the Legislature has a long and sorry history of being exceedingly generous to the district court clerk magistrates who rule over those proceedings and protective of their many perks and privileges. So how to untangle this mess? “In deciding whether to allow access to a particular show-cause hearing, clerk-magistrates should consider not only the potential drawbacks of public access, but its considerable benefits,” she wrote, clearly channeling Holmes. There was also a time, not so long ago — 2003 — when the SJC ruled that show-cause hearings were only intended for misdemeanors. Legislators, perhaps fearing their clerk magistrate pals didn’t have nearly enough power, amended the law the very next year to cover felonies as well. That put the district courts on the slippery slope we face today. Too much power and too little transparency is a prescription for abuse. When a 2006 Globe Spotlight series exposed a shocking culture of coziness in small claims courts between clerk magistrates — yes, them again — and debt collection agencies, the chief of the district courts appointed a 20-member task force, which came up with a sweeping set of reforms in 2007. The SJC adopted new rules for the small claims courts that went into effect in 2009. And if you are thinking our state’s highest court works on administrative issues at a glacial pace, you’d be right. But even glacial has to start somewhere — and right now all we’re hearing from the SJC and its Chief Justice Ralph Gants is crickets. How difficult would it be to name a task force to revisit those 1975 district court “standards”? Why couldn’t hearings be presumptively open rather than closed — just for starters. Allowing such hearings in the case of felonies is simply wrong. That law should be repealed with the same speed it was passed in 2004. Rachelle G. Cohen is a contributing columnist, a member of the Globe editorial board, and cochair of the Supreme Judicial Court’s Judiciary-Media Committee.